Shop Local: Campfire & Co.'s Holiday Gift Guide — Campfire & Co. The holidays are upon us people! So many gifts to buy, so little time! I know it's tempting to shop in your PJs online before your Netflix and chill, but it's also really rad to support the many small, local businesses that make our city an incredible place to live. Trade that last minute Amazon order for some of these awesome gifts that are either made or found locally in a small boutique shop near you. 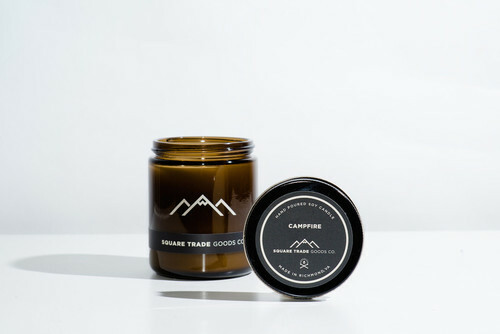 Campfire Candle by Square Trade Goods Co.
For that special friend or family member who has a serious case of adventuring, this candle is everything. "Woodsmoke mixed with pine and cedar woods topped off by the subtle sweetness of amber." Find lots of other candle scents and American made goods at STGC. Great Musicians Calendar by NA NIN x Campfire & Co.
Ok we're a little biased here, but we think our third annual Great Musicians Calendar collaboration with Kate Jennings of NA NIN is the perfect gift for literally everyone on your list. Each month's calendar features with a special lyric from some of our favorite musicians in a minimal, high contrast graphic typeface. Find them and lots of other handmade gifts at NA NIN online and in store. Nine Roses Jewelers is bringing some of the most incredible independent jewelry designers and makers from around the world to Richmond. One of our most favorite pieces is the Three Spirits Ring by Communion by Joy, but really everything by this designer is making us swoon. If you get overwhelmed by trying to find the perfect gift for that special someone, send them over to Nine Roses to make a wish list! Nick and Eliza will keep their list handy for when you return. A modern wallet for folks who like their objects to be as beautiful as they are functional. These local machinists operate under the notion that if you're going to carry something everyday, it should be enjoyed and well crafted. Find more wallets and locally machined goods at Machine Era. Two for one here folks - support local jewelry designer and maker Minerva while shopping at one of our favorite new and vintage boutiques, Rosewood Clothing Company. We love these gold fill hoops for their subtle statement quality. Find these and tons more gifts from local designers and makers at Rosewood. The greatest lesson that Elf taught us is that syrup is great on everything. Find Virginia-made Back Creek Farms Syrup locally at Little House Green Grocery in the Northside. It's sugary, it's mapley, it's a great gift for the foodie in your life. Tea towels never go out of style people! This one is hand screen printed by local business Triple Stamp Press. This gift is great for anyone with a kitchen! Find lots more screen printed goodies in Triple Stamp's online shop. Don't forget the cards! Celebrate the holidays with your out of town friends and family members with a lovely hand drawn, hand letterpressed card in the mail. These adorable Merry Everything cards are made locally by Post Rider Press. Find these and more letter press goods in her Etsy shop. WHAT?! You still want MORE?! Ok well make sure to stop by these local shops for one of a kind gifts and goodies, many of which are locally or American made. Santa wants you to shop local for the holidays! Please share your favorite local shops and products to gift in the comments and happy eggnog season friends!